Due to administrative delays and case backlogs, it can take more than ten months from the date you request a hearing before your case is actually heard. It is important that you keep treating with your doctors during this period. Likewise, it is important that you keep in contact with your attorney and apprise him or her of any changes in your medical condition. In the months leading up to your hearing, you should continue sending updated medical records to Social Security with instructions that it be included in your file. If you have retained an attorney, it is important that you stay in contact with him or her and advise them of any changes in your medical condition or any medical treatment you received. It is important that your medical record be continuously updated as you await your hearing. Unfortunately, Social Security will not undertake such a task, so it is important that you provide these records to them or hire an attorney who has the staff and resources available to contact your doctors, hospitals and clinics on your behalf and obtain copies of these records. Your hearing will last approximately 45-60 minutes. It is an informal proceeding and generally the only people in the hearing room will be the administrative law judge, his clerk, you, your attorney, and a medical expert and a vocational expert. You are allowed to bring your spouse and any witnesses you may have. The hearing begins with the judge swearing you in and explaining the process to you in general terms. (If you are represented at the hearing, the judge will then allow your attorney to make a brief opening argument.) The judge will then spend 10-20 minutes asking you about your impairments, what you typically do on an average day, why you can’t work, and the types of things you do around the house. The judge will then ask the medical expert and vocational expert whether they have any questions for you. The judge will then proceed to elicit testimony from these expert witnesses. Most of what the experts testify to will be based not on what you have stated in your testimony, but rather on the evidence contained in your file. After the judge has questioned the experts, he or she will allow you (or your attorney, if you have one) to cross-examine the experts. The judge will then allow you (or your attorney) to offer any closing arguments. Within 1-3 months after the hearing the judge will mail you a copy of his decision. 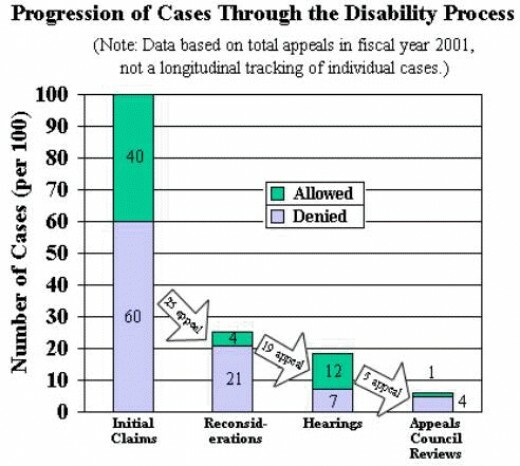 Approximately 55% of all claims that are brought to a hearing are approved. Statistics show that people who are represented by an attorney have been much more successful in attaining benefits than people who chose to represent themselves.